Earlier this week, the Transit Museum hosted a panel discussion on the history and look of the New York City subway map. It was the second such event in a month, and it seems that the field of map design is undergoing something of a renaissance, especially in regards to our map. From the pre-Vignelli days to the current John Tauranac-inspired version that you can’t actually use in the subway system due to its absurdly large size, we could (and have) discussed map preferences for posts on end. Perhaps, soon I’ll revisit the topic. In the meantime, Peter Lloyd, a historian with a specialty in the New York City subway map and its various iterations, is trying to raise funds for a multi-volume book detailing the history of our subway map. With only a few days left in his Kickstarter campaign, he’s a bit short of his goal. Check out his proposal here, and consider if it’s a worthy endeavor. I’m a sucker for subway map histories, and I hope his book can see the light of day. Meanwhile, we have weekend changes to discuss. There’s a map for those — hosted by the MTA at the Weekender site. The descriptions follow. From 11:30 p.m. Friday, November 20 to 5:00 a.m. Monday, November 23, 1 trains are suspended in both directions between 14 St and South Ferry. Take the 23 trains and free shuttle buses instead. Free shuttle buses provide alternate service between Chambers St and South Ferry. From 6:30 a.m. to 7:00 p.m. Saturday, November 21 and from 9:30 a.m. to 7:00 p.m. Sunday, November 22, 1 trains run every 16 minutes between 137 St and Van Cortlandt Park-242 St. The last stop for some trains headed towards Van Cortlandt Park-242 is 137 St.
From 3:45 a.m. Saturday, November 21 to 9:00 p.m. Sunday, November 22, Van Cortlandt Park-242 St 1 trains run express from 215 St to Van Cortlandt Park-242 St.
From 11:30 p.m. Friday, November 20 to 5:00 a.m. Monday, November 23, 2 trains run local in both directions between Chambers St and 34 St-Penn Station. From 6:30 a.m. to 12 Midnight Saturday, November 21 and Sunday, November 22, 3 trains run local in both directions between Chambers St and 34 St-Penn Station. From 11:45 p.m. Friday, November 20 to 7:30 a.m. Sunday, November 22, and from 11:45 p.m. Sunday, November 22 to 5:00 a.m. Monday, November 23, Crown Hts-Utica Av bound 4 trains run express from 14 St-Union Sq to Brooklyn Bridge-City Hall. From 4:00 a.m. Saturday, November 21 to 10:00 p.m. Sunday, November 22, Woodlawn-bound 4 trains run express from Brooklyn Bridge-City Hall to Grand Central-42 St.
From 6:00 a.m. to 11:30 p.m. Saturday, November 21 and from 8:00 a.m. to 10:00 p.m. Sunday, November 22, 5 trains run every 20 minutes between Eastchester-Dyre Av and Bowling Green. Eastchester-Dyre Av bound 5 trains run local from Brooklyn Bridge-City Hall to Grand Central-42 St.
From 11:45 p.m. Friday, November 20 to 5:00 a.m. Monday, November 23, Brooklyn Bridge-City Hall bound 6 trains run express from 14 St-Union Sq to Brooklyn Bridge-City Hall. From 6:45 a.m. to 10:00 p.m. Saturday, November 21 and Sunday, November 22, Mets-Willets Point bound 7 trains run express from 74 St-Broadway to Mets-Willets Point. Euclid Av and/or Rockaway Blvd. A service will operate normally between Inwood-207 St and Eculid Av, and between Rockaway Blvd and Far Rockaway every 20 minutes. From 11:45 p.m. Friday, November 20 to 5:00 a.m. Monday, November 23, E trains are rerouted via the F in both directions between Roosevelt Av and W4 St-Wash Sq. Free shuttle buses run between Court Sq-23 St and 21 St-Queensbridge, stopping at Queens Plaza. From 12:01 a.m. Saturday, November 21 to 5:00 a.m. Monday, November 23, E trains run local in both directions in Queens. From 11:45 p.m. Friday, November 20 to 5:00 a.m. Monday, November 23, F trains are suspended between Coney Island-Stillwell Av and Kings Hwy. From 12:01 a.m. Saturday, November 21 to 5:00 a.m. Monday, November 23, F trains run local in both directions in Queens. From 11:30 p.m. Friday, November 20 to 5:00 a.m. Monday, November 23, N trains are suspended in both directions between 36 St and Coney Island-Stillwell Av. N trains are routed via the D line in both directions between 36 St and Bay Pkwy-95 St, the last stop. DR trains and free shuttle buses provide alternate service. Free shuttle buses operate between 36 St and Stillwell Av, making all station stops. Transfer between R trains and shuttle buses at 59 St.
From 11:45 p.m. Friday, November 20 to 6:30 a.m. Sunday, November 22, and from 11:45 p.m. Sunday, November 22 to 5:00 a.m. Monday, November 23, 36 St-bound R trains stop at 53 St and 45 St.
To say that this addition ain’t pretty is an understatement, and it may also violate some central tenets of the current map. First, what is going on here? The purple line showing the 7 line extension cuts through the word “Terminal,” which itself is part of the name of the stop at 42nd St. and 8th Ave. Plus, it’s now not immediately clear what’s happening at Times Square as the white dot only sort of touches all four of the lines that stop there. It’s not too clear that there’s a direct transfer from the 7 to the A/C/E, and it now looks as though the 7 doesn’t provide easy access to the Port Authority Bus Terminal. While you and I may know how Times Square works, a subway map isn’t supposed to be designed for people who know the system; it’s supposed to be designed for those who don’t. This purple line isn’t helping. Meanwhile, if you look at the normal markings for a terminal, the colored block with the line’s route designation usually appears right near the white circle designating the terminal. You can see it above for the L train at 14th St. and at right for the 7’s eastern end in Flushing. Here, the purple square is underneath the word “Yards” and next to the handicap symbol and another 7 that’s just sort of floating there. It should be under the black circle denoting the station (and that black circle should be white since both local and express 7 trains will service Hudson Yards). Yet, placing the purple block would cause conflicts with the designation for the 8th Avenue’s Penn Station stop since the avenue spacing here has been distorted for design purposes. Instead of adjusting a geographical inaccuracy, the map designers just shoved this thing wherever it could fit. The debate over designing a better map can fill volumes, but one way to present the information, at least for a mobile-optimized experience, comes to us via KickMap. Eddie Jabbour and I had a back-and-forth about the design on the Second Ave. Sagas Facebook page, and he presented the idea of showing the 7 connecting to 42nd St. via a “T.” The avenue distances are still distorted but are closer to reality than the MTA’s design. His map also incorporates the Javits Center, a key destination for the 7 train, rather than a ferry terminal floating somewhere between 34th St. and 42nd St., as the MTA’s map shows. It’s a better presentation with more relevant data than the MTA’s map has. The MTA will have a second chance over the next year and a half to redesign the map when three new stops open underneath Second Ave. I hope they take the opportunity to do so; this thing is in bad need of a rethink and a better design. When the MTA unveiled their latest iteration of the subway map a few years ago, they did so with a caveat. The confusing service status box, detailing various changes at different times of day, disappeared, and the map was intended to represent peak-hour and midday service during the week only. A short-lived Night Map was available, depicting overnight service, and weekend changes are handled via signage and The Weekender. Last week, though, the status box made a triumphant and streamlined, albeit still flawed, return. As many have noted and as I photographed last week, in addition to the reopened Montague St. Tunnels, the September printing of the subway map also contains a new guide to weekend and overnight service. Using subway bullets and better descriptors, the guide presents information in an easy-to-digest format. It lacks information — such as when these so-called “late night” service patterns begin — that isn’t readily available in the system. For some reason, the MTA hasn’t been keen to announce last trains on routes that don’t run 24 hours or when exactly, say, the D train will start running local in Brooklyn. That’s just something regular riders pick up, and the new feature doesn’t cover the gap. Still, this is a welcome return of an old feature that shouldn’t have gone away in the first place. It’s not perfect, but it’s information that people need to ride. Otherwise, they may find themselves simply too confused by the subway map to make heads or turns of our ostensibly complicated network. Don’t believe me? Just talk to Bim Adewunmi instead. If this looks familiar to some, it’s because this is a story I covered via an Instagram posting a few days ago but didn’t have a chance to write up until now. Follow Second Ave. Sagas on Instagram for more sights and scenes from the city’s subways. Massimo Vignelli’s original vision for subway wayfinding involved three pieces — a schematic map, a guide to subway service and a geographically accurate neighborhood map for immediate navigation aboveground. At various points in time, these elements all caught on but not at once when the late designer introduced the concept in the early 1970s. Today, in my opinion, the MTA’s neighborhood maps, complete with nearby landmarks and subway staircase location, are the most useful of the various guides and maps the agency offers, and this week, Transit formally announced a redesign in conjunction with NYC DOT’s WalkNYC wayfinding initiative. For over two decades, the MTA has maintained neighborhood maps through shifting subway service patterns and changes above ground. Currently, the agency has 68 maps in all 468 subway stations, each with a radius of around 15-30 blocks. The current iteration is imprecise as the same map you’ll see in, say, Union St. is the same as the one hanging at Grand Army Plaza or 15th Street-Prospect Park stations. The new Pentagram-designed maps will instead be centered around the station in which they hang and incorporate the design of the WalkNYC wayfinding maps but with more information relating to other transit options included local, express and SBS lines. The new maps will focus on around only 12 blocks instead. The station schematics in the neighborhood maps will remain in the new versions. The new signs are currently in five stations that all intersect the SBS B44’s route. The list includes Bedford-Nostrand on the G, the Nostrand Ave. stations along the 3 and A/C, and the 2 and 5 trains’ President and Sterling St. stations. It’s a subtle, but positive, improvement for the benefit of customers. Whenever I unfold one of my original 1970s Massimo Vignelli subway diagrams, I’m always struck by how small they are. Compared with the maps the MTA hands out today that lend themselves to awkward interactions that clearly indicate someone unfamiliar with the subways, the city or both, Vignelli’s maps open smaller than even a tabloid newspaper. They were meant to be stuffed into a pocket and consulted when needed. They also launched a thousand endless debates of form over function. To honor Vignelli, who passed away on Tuesday at the age of 83, let’s have another. For the vast majority of New Yorkers — or at least the vast majority of New Yorkers who have heard of him — the name Massimo Vignelli conjures up images of a very distinctive style in subway map history. For 42 years, in fact, New Yorkers have debated this map, and in the minds of this city’s millions, it will be Vignelli’s lasting legacy even as our lives are infused with his designs for American Airlines, for National Parks brochures, for Big Brown Bags, for countless other items that use and exploit the stark lines of Helvetica, his preferred font. Over the past few years, I had the opportunity to see Vignelli speak, first on a panel and later in a presentation. He had a sharp wit and a good sense of humor, but he also had a clear stubborn streak. He always felt, long after the MTA pushed him away and then brought him back into the fold, that his subway diagram — definitely not a map, mind you, but a diagram — was better than anything before it and certainly better than the overloaded mess of a map the MTA has tried to streamline in recent years. It had smooth angles, clear lines and obvious colors, and it was designed to get a straphanger from place to place underground, not from place aboveground to place aboveground via the underground. New Yorkers of course hated it. Their subway map had been an amorphous blob of shades of grey, red and green, and the new Vignelli map was a shock to the system. It had so many colors and lines and angles, and for some reason, parks weren’t the right shape and 50th St. and 8th Ave. was east of 50th St. and Broadway. That, from day one, seemed to be the sticking point. 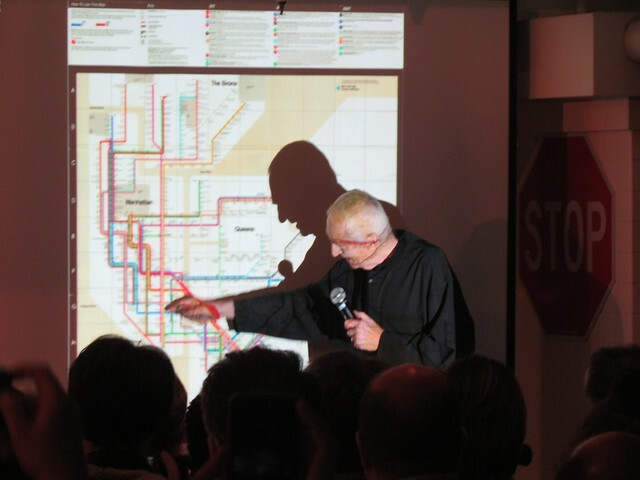 Vignelli’s diagram, designed to be used by those with a modicum of knowledge about the city’s grid and in conjunction neighborhood maps that, to this day, still populate subway stops, was a geographic mess. After seven years of complaints, the MTA torpedoed his subway diagram in favor of the first version of the map we know and use today. Over the years, Vignelli would harbor grudges against those at the TA who pushed him out, but he eventually reached a detente and a reconciliation. He redesigned his map in 2008 for Men’s Vogue, and the printing sold out nearly immediately. The diagram appeared on a dress at Nordstrom’s in 2009, and he reproduced a 2012 version that currently hangs in my living room. His design formed the basis for the MTA’s Weekender app and the Super Bowl’s Regional Transit Diagram. Long a piece in the Museum of Modern Art, his diagram is seeming here to stay in some form or another. Massimo’s legacy extends well beyond this controversial map. In addition to the ways in which his designs have created conversation and controversy, he also streamlined signage in the subway system. He and Bob Noorda, who passed away four years ago, reimagined the way signage works and appears in the subway system. With a few changes, his Helvetica designs remain in place (though he, like I, never embraced “Exit Middle of Plat” as an appropriate shorthand for anything). The general philosophy behind subway signage lives on in the Graphics Standard Manual. Vignelli’s passing leaves that role of stubborn, funny, cantankerous man to someone else. His map, his subway diagram, his angles and font will forever live on. For more on Vignelli, I recommend the obit in The Times, and a piece penned in The Wall Street Journal by friend-of-SAS Keith Williams. Michael Beirut offered up his memories of Massimo as well. The Vignelli map, in wearable form. As far as creative takes on New York City subway maps go, I’m a pretty accepting guy. I don’t hate the current map, though I find it a bit overrun with information, and I’ve always enjoyed attempts at reimagining the map. The Vignelli map, of course, remains the standard for artistic design trumping usefulness, and the KICK Map seems to meld something easy to read with something useful. Lately, we’ve seen New York’s system with a DC twist, a regional transit map and even a circular map. But now I’ve found one I don’t like. Over the past few days, Jug Cerovic’s project to standardize the world’s subway maps has been making the rounds. As The Atlantic Cities’ Jenny Xie explained, Cerovic has tried to come up with a design that can be applied across the world and is both easy to read and easy to memorize. It otherwise fails as a useful navigating tool. Underlying all of this is INAT, a set of guidelines Cerovic developed to help him design maps that are easy to read and memorize. Key rules? Enlarging city centers to accommodate the crowd of lines and stations, and using a uniform set of colors, symbols, and labeling. He also kept all the lines vertical, horizontal, or 45 degrees inclined, and limited most of them to no more than five bends on their entire lengths. Some might argue that uniformity wipes out the cities’ unique identities. But Cerovic says he tried to make each map very different through overarching symbolic shapes. For example, the Moscow design follows the form of a circle, while the Beijing design is more rectangular. Cerovic compares his maps to road signs. “They’re not the same in the whole world but they’re very similar — so if you go to another place, you’ll seem to recognize the meaning of the signs,” he says in a phone interview. That’s all well and good, but take a look at New York City on top. What is going on there? Bay Ridge and Coney Island appear to be due east of each other and of Lower Manhattan; Central Park is a puny rectangle toward the northern part of Manhattan; and the G train terminates north of Atlantic Ave. near both 7th Ave. and Prospect Park on the BMT Brighton Line. It violates the basic tenets of cardinal directions and map making. Even the best subway schematics have some bearing on reality; this one has none. I appreciate what Cerovic is trying to do. I see why you might want to pick a universal design for subway maps, but if you’re going to try to produce a quasi-geographic schematic, it must have some relation to reality. It cannot be so divorced from the city layout to be useless as a map and as a navigation tool. But I’m not one to pass up an opportunity to share a new map with the world. So there you go. I don’t like it, but it’s a twist. I’m always a sucker for a good map and even more so when it’s actually a subway map with a related gimmick. Here’s a good one via Reddit that’s been making the rounds. It’s a mash-up of the best Manhattan coffee shops by subway stop. Click the image above for a larger version; it should open in a new window. Now, as with any of these “best of” maps, there’s bound to be debate. Eataly, for instance, is a bold choice for the 23rd St. BMT stop, and Pier NYC on Roosevelt Island is a seasonal outdoor food spot without much of an emphasis on coffee. But with the exception of a few dry spots — that Dunkin Donuts at 110th St. on the 2/3 sticks out like a sore thumb — it avoids chains and Starbucks. Now, imagine the same for the city’s bars or restaurants or even an expansion into Brooklyn, Queens or the Bronx. A few weeks ago, I wrote on the first-of-its-kind regional transit diagram that the Port Authority, MTA and NJ Transit had produced for Super Bowl visitors. While it doesn’t show frequencies, the map offers an overview of the region’s rail connections between New Jersey and Manhattan. As Sunday’s Big Game is part of the so-called Mass Transit Super Bowl, this map is designed to get people from one side of the Hudson to the other with few mishaps. I’ve had a lot of inquiries concerning hard copies of this map. You can download a PDF, but for many, that’s not good enough. For the map-hunters among us, you can find small Z-fold maps at a variety of locations throughout Manhattan and New Jersey, including the Super Bowl Boulevard set up on Broadway, Penn Station and Grand Central. I’ve heard they’re also available at some PATH trains and Secaucus Junction. It’s small and with many folds, but one way or another, these things will wind up on eBay selling for obscene amounts in a few years. Grab one while you can. As await the first storm of 2014 to blanket our city in snow, here’s a fun little fantasy map for you: Chris Whong has reimagined the New York City subway in the style of Washington, D.C.’s Metro map. His site includes an explanation behind the project and a larger, zoomable version of the map as well. Striped of much of its geographical context, the map contains strong angles and bullseye station indicators. There are a few errors in the initial draft, but it’s certainly a different take on the form and functionality of a subway map. While the map looks great, it really also shows how unsuited the bold, simplistic approach taken by the DC diagram is to a complex transit system like New York’s. Vital information that New Yorkers depend upon for daily travel is simply nowhere to be found: the distinction between local and express stations, for example, or any indication of those hugely important free transfers between certain stations. The express/local divide is a real problem, but I’m not so sure the simplistic approach is ill-suited to New York, as Booth argues. Rather, Whong’s draft is trying to do something that our standard subway map isn’t. Instead of offering up a navigation tool that attempts to bridge the geography/schematic divide, Whong’s draft is focused entirely on the subway routing. You have to be familiar with the streets or have your own map of the surface. Maybe that’s the better approach for a subway map anyway as no one can use the MTA’s offering to truly navigate parts of the city that are off the grid. Anyway, food for thought and debate. Ain’t that just the prettiest little thing you ever did see? Click on it if you’d like to see it in extra large. There’s a PDF available too. According to the MTA, for those looking for a hard copy of the diagram, check out the guides publications distributed by the Super Bowl Host Committee. The group will also make folding pocket maps available, and I’d imagine those will fetch a pretty penny on eBay later on. The MTA also plans to release four commemorative Super Bowl-branded MetroCards, available at all stations. As to service patterns, I discussed the plans in depth earlier today, but the MTA reiterated that it will provide “more frequent rail service” during Super Bowl week. All regional transit agencies plan to halt construction during the time period too to ease travel, as 400,000 folks — or about a third the crowd in Times Square on New Year’s Eve — descend upon the area.